Our buckwheat experiment is not what I would call a success. The best thing I can say is that our bees did really enjoy the flowers. And the plants do bloom, as promised, a scant month after planting. But all of the biomass that was supposed to be ready when the plants bloomed? Nope, not so much. Buckwheat doesn't like heavy clay soil, which is the precise kind of soil I was asking it to rejuvenate, so I shouldn't blame the failure entirely on the crop. And, to be fair, a deer came through for a midnight snack a few weeks ago and clipped the tops off plants in a couple of beds. Those buckwheat plants never recovered, and weeds quickly sprouted up to fill in the bare soil. Still, I would have expected a bit more growth out of the cover crop. 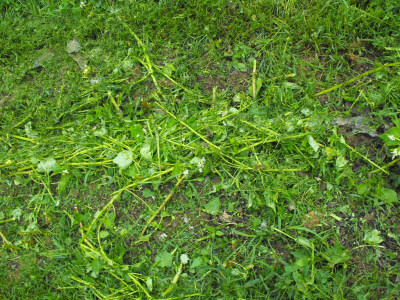 When I mowed down the buckwheat, it seemed like the succulent stems disintegrated into a mere handful of plant matter --- and that was in the beds that escaped deer damage. I may give buckwheat another shot in the loam of the upper garden, but our troublesome back garden is going to need another cure. Next try --- hullless oats. Our squeaky clean, homemade chicken waterer keeps hens laying longer. I'll be interested to see how the hulless oats do in the heavy clay. 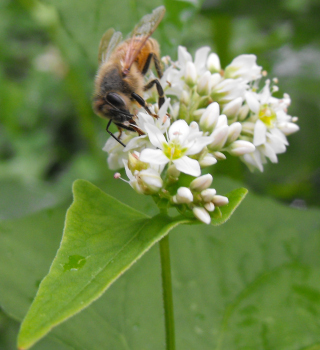 We had the exact same issue with the buckwheat, though I liked the way that it looked and the pollinators did seem to like the flowers. We're thinking about trying out some clover this fall. I remember you saying that, and I clearly should have heeded your advice! Oats are supposed to do better in clay, but we'll see. I'd love to try clover, but don't want to till, so am a little stuck on how to deal with perennial cover crops. i just planted buckwheat 3 weeks ago. we have really sandy soil though so i am hoping for better luck. from what i have read which is not a ton you really want to plant buckwheat six weeks before your first frost. maybe the summer heat did it wrong? Good point. I think that some people plant buckwheat when I did if they want to harvest grain, but you're right that it's supposed to like cooler weather. Too bad! I was hoping it could be a quick cover crop to throw in anywhere in the rotation.